In today’s fast-paced digital marketplace, Retailers and Food Service companies are rapidly adopting technology as a key to optimize their supply chain operations. And JJ Food Service, UK’s leading Food Service specialist, has always been at the forefront of leveraging cutting-edge technologies in everything it does. 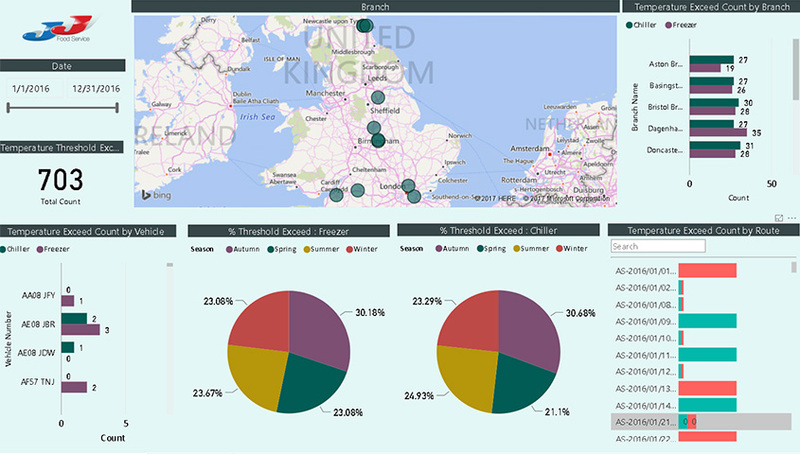 Recently, the company utilized Microsoft Power BI to create a Business Intelligence environment, with a goal to empower its operations team, mobile workforce, and food-delivery personnel with information essential to make intelligent decisions on-the-fly. JJ Food Service supplies a range of food items and non-food products to restaurants, cafes, caterers, schools, and Delis in the UK. It manages the entire supply chain operations in-house—from taking the customer order to the delivery of items to the customer’s kitchen. Delivering items to several customers involves keeping track of different routes, field workforce & assets in order to make each delivery a success. It has a fleet of delivery vehicles customized with temperature control sensors to manage successful delivery of perishable food-items. JJ Foods has the ability to control complete supply chain operations, which demand high-quality delivery of 4500+ varied products to more than 30,000 customers, from 11 distribution centers using 125 delivery trucks. Absence of insights into various activities of drivers, such as time-taken for delivery, longest hours, maximum mileage, vehicle halt period, items damage incurred during transit, etc. These insights would help the teams to understand the performance of drivers and provide necessary trainings to overcome their challenges. No single view of freezer & chiller temperature data obtained from the fleet of delivery vehicles. If it could, then it would track & identify the optimal threshold pattern for the delivery of high-quality food items. Tracking all items available in the warehouse manually was a tedious task. There was no real-time visibility of stock availability and list of undelivered items available for re-usage. If it could, it would stock-up inventory before it is unavailable. Unified data view on the go from any device for health monitoring of the business was an impossible task. No consolidated data view at a single point of time to get a 360-degree view of the business. If it could, it would make the right decisions at right time. No means to track and monitor customers that show abnormal behavior; who order items, but changes their decision at the delivery time and rejects the items. To keep a watch on the list of damaged products and the quantity pertaining to it in real-time was cumbersome. To overcome all these challenges, JJ Foods engaged Saviant to build a solution that would also help in running its entire supply chain operations efficiently. Helps create efficient supply chain operations environment, with real-time insights on Temperature threshold, Driver performance & Customer behavior; thereby maximizing operational efficiency. Enables intelligent decision making; by utilizing the power of intuitive rich visuals and reports generated from staggering number of customer, inventory and workforce data. Provides consolidated view of the data fetched from multiple sources; in the form of interactive dashboards. Delivers critical insights into various activities of 125 drivers, to determine the areas of improvement and boost their efficiency. Helps to manage over 4500 products through a unified dashboard view, to understand the damages and losses incurred every month. Unlocks insights into food delivery events that help determine the temperature threshold exceed pattern, to ensure minimal risk of customers returning the goods. "Creating a single view of large volumes of Customer, Product and Field force data was critical, to drive efficiencies in our supply chain operations. Saviant team built an intuitive Power BI solution that analyzes the behavior of over 30,000 Customers & 125 drivers, and also provides a detailed stock damage analysis of over 4500 products. The Saviant team’s technical know-how and commitment in providing a solution that best fits our needs has been impressive," says Mushtaque Ahmed, Chief Operating Officer of JJ Food Service. The Business Intelligence solution helped JJ to unlock critical insights into food delivery operations; starting from route planning, warehouse to successful fulfilling of customer order. Thereby, minimizing the efforts and time consumed in analyzing the data manually. With the Microsoft Power BI solution, JJ Food Service could see impressive potential benefits that would empower its operations team in intelligent decision making; to efficiently manage its supply chain operations. Overall the solution helped gain accuracy, efficiency and improve customer service. This article also appeared on Microsoft Enterprise, a platform for Industrial Enterprises to get latest insights, partners, and business solutions. Read the published post here. Talk to our Power BI expert, today!